Lancaster City boss Phil Brown says his side can take nothing for granted when Goole visit Giant Axe on Saturday. The East Yorkshire outfit may be second from bottom but there have been some shocks as the race for the Evo-Stik First Division North title twists and turns in the closing weeks of the season. Chief amongst those is Goole winning 2-1 at current leaders Farsley last month. The Celts are a point clear of City at the top but Brown’s men do have a game in hand which comes at Prescot Cables next Tuesday night, April 11. The Blues boss doesn’t believe any surprise scorelines are down to promotion nerves however, more because of the wide open nature of the division this season. “It’s this division,” said Brown. “Anyone can beat anyone. If you’re not at it you’re open to being on the wrong end of a result. “It’s the same for a lot of a teams and it doesn’t matter where you are in the league table. The Dolly Blues certainly found that out last Saturday. Colne may have been one of the form teams in the division, their 2-1 victory at Giant Axe, their fifth win in a row, but Brown was underwhelmed by his side’s lacklustre performance on the day. “Saturday was disappointing from our point of view,” said the City boss. 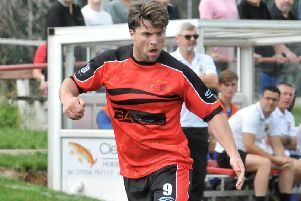 “We can talk about Colne being the form team but we didn’t perform to the level we need to or can do. “We got nothing out of the game and that’s what we deserved. “It’s about us and our performance. Striker Louis Mayers is available to face Goole after his suspension and Brown could look to bring some players back from dual registrations in a bid to boost his options. Forward Charlie Waters has been turning out for Squires Gate while goalkeeper Luke Raybould has been between the sticks at Nelson.